Inflation remains squarely on the radar screen as a driver of interest rates, particularly when the labor market is tight and the unemployment rate is below 4%. 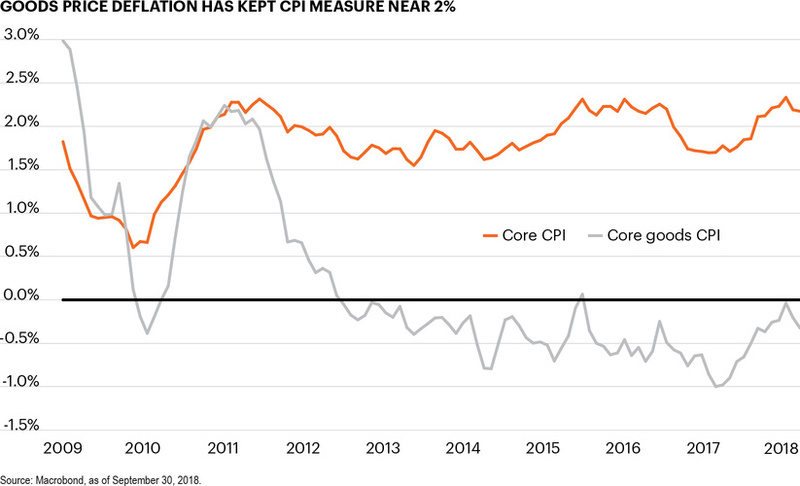 Yet core CPI, a measure of consumer price inflation that excludes food and energy, has been remarkably stable at around 2%, the Fed’s inflation target. Services prices, particularly medical care and shelter costs, have consistently shown faster price growth than the overall index. Offsetting this has been declining prices for goods. Goods make up only 20% of the core index, but goods prices have been in deflation since 2013,1 meaning goods prices have actually fallen. This has been critical in keeping overall inflation in check for the past several years. We will be watching: As rhetoric gradually turns into action, the trade dispute between the U.S. and China bears monitoring for its potential effect on goods prices. So far, President Trump’s trade policy has announced tariffs on more than $250 billion worth of Chinese goods, as the administration has homed in on trade with China while tensions with the E.U. and Canada have cooled. So far the dispute has not had a major impact on goods prices, which continue to show moderate deflation. Yet the relationship with China still carries significant uncertainties. If the two sides can avoid a further escalation, we expect goods inflation to remain muted and core inflation to stay near the Fed’s 2% target. Risks to our view: Should the trade dispute with China escalate to a full-blown trade war, goods prices could rise, pushing broad-based inflation meaningfully above 2%. The Fed may view this as a tax, however, and in our view would be unlikely to respond to tariff-driven inflation with an aggressive series of rate hikes. 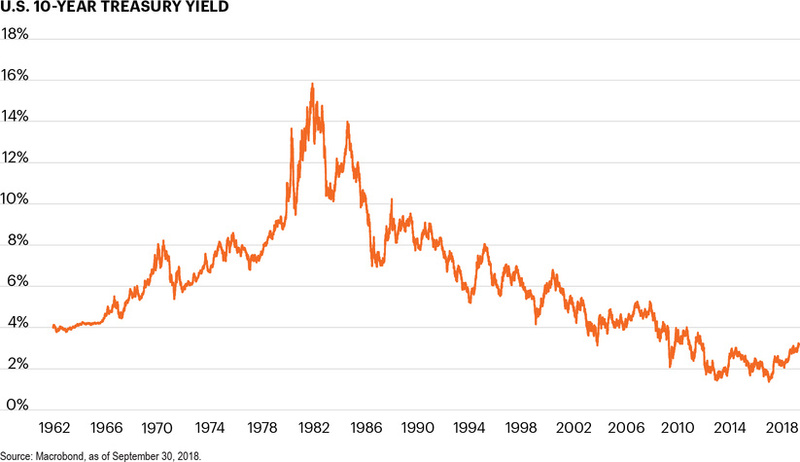 Interest rates have been on a long-run downtrend, driven in part by a structural decline in real interest rates. Real interest rates, which are adjusted for inflation, have been significantly impacted by demographics. The oversized baby boomer cohort has led to a global increase in demand for safer, income-driven assets. This has pushed prices up and yields down. The significant increase in length of retirement has also caused savings behavior to intensify. Despite a strong economy and renormalization of policy rates, we believe interest rates are likely to stay low by historic standards for the foreseeable future. We will be watching: Recently, growth significantly above trend and supportive monetary conditions have caused real rates to move modestly higher. However, we expect this trend to stabilize. One key aspect of real interest rates is the underlying natural rate of interest, which is not directly observable. With one exception, the Fed has estimated this rate at between 0.8%–1.0% for the last two years.2 In other words, robust growth may cause real interest rates to edge higher, but we do not expect the underlying structural trends keeping interest rates low to dissipate. Risks to our view: Academic literature is often chasing the latest trend, and just as the impact of demographic trends was underestimated as real interest rates fell, it may be overestimated as the economic expansion continues. Should productivity resurge in a meaningful way, potential growth would improve, raising real interest rates. Likewise, if academic models have overestimated the impact that global savings are having on the underlying natural rate of interest, real interest rates could show greater long-run gains than currently anticipated. Fed estimates and academic research bear monitoring. Recently long-term yields have moved up, and they notably reached a 7-year high of 3.25%.3 However, yields are still significantly lower than during prior expansions. One key factor holding long-term interest rates low and challenging traditional fixed income returns is low international interest rates. While U.S. yields are low on a historic basis, they are actually the highest among developed countries, as illustrated in the chart below. 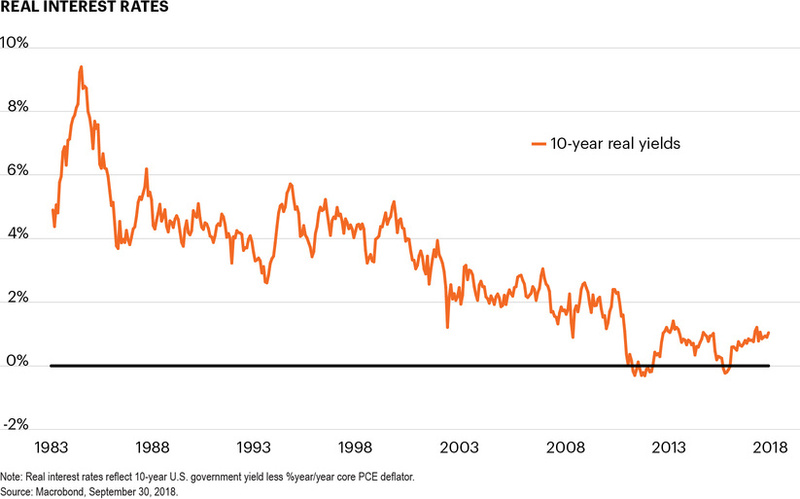 We will be watching: In today’s global financial markets, international monetary policy and long-term rates need to be monitored for impact on U.S. yields. Investors will flock to where they see the best risk-adjusted returns. 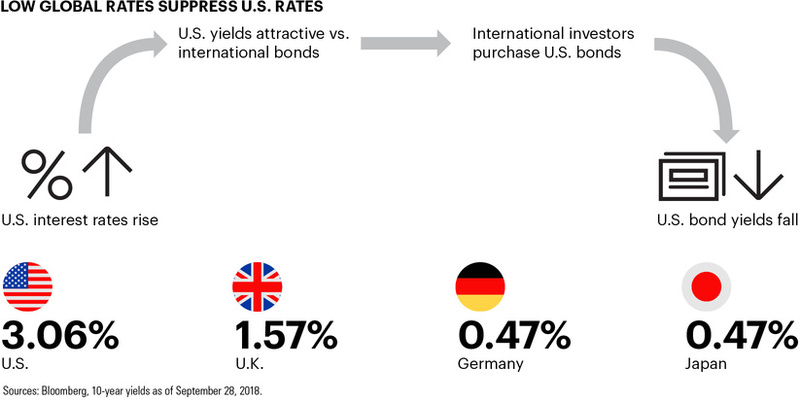 With U.S. 10-year Treasury rates significantly higher than government-backed debt in other developed countries, investors may continue to see U.S. government debt as an attractive source of income. This elevated demand could push Treasury prices up and yields down, likely putting a cap on how high U.S. rates can go while global yields remain so depressed. Risks to our view: U.S. rates could move significantly higher if inflationary pressure is unleashed by a robust economy and a tight labor market. Additionally, any sign of perceived increased risk of owning U.S. government debt, fueled by a higher deficit, could also push long-term yields upward. 1 BLS and Macrobond, as of September 28, 2018. 2 This range reflects the central tendency range of the long-run Fed funds rate, less the long-run projection for inflation. The most recent quarterly estimate is included in the economic projections from the September 2018 meeting. In September 2017, the Fed lowered its range estimate of the natural rate of interest to 0.5%–1.0%. 3 10-year Treasury yield; Bloomberg, as of September 28, 2018.